Wanna change your BlackBerry ringtone? Making BlackBerry ringtones can be quite easy with 4Media BlackBerry Ringtone Maker. The BlackBerry Ringtone maker software can convert any music and video files on your computer to BlackBerry ringtone format - MP3 files. Load your beloved music, get the music converted to MP3 ringtone and make the ringtone transferred to your BlackBerry mobile phone memory card directly. If you own a BlackBerry mobile phone and wanna spot the caller from the ringtone you hear, then a full-featured BlackBerry ringtone maker is definitely necessary. With high support for a wide range of video and audio formats including AVI, MPEG, WMV, DivX, MP4, H.264/AVC, AVCHD, MKV, RM, MOV, XviD, 3GP, WMA, WAV, RA, M4A, etc., 4Media BlackBerry Ringtone Maker enables you to create BlackBerry ringtones from any music and videos freely. This BlackBerry ringtone converter provides you with the capability of transferring converted MP3 ringtone to BlackBerry mobile phone memory card directly after converting to MP3 ringtone, which saves time and trouble greatly. To help you create your own ringtones, 4Media BlackBerry Ringtone Maker allows you to clip music segment and pre-listen to the music. 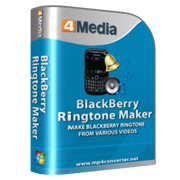 Incredibly easy to create BlackBerry ringtones with 4Media BlackBerry Ringtone Maker! Spice up your BlackBerry mobile phone and create MP3 ringtones from your beloved songs and videos now. Make custom ringtone from the following audio formats: WMA, WAV, RA, M4A, AAC, AC3, OGG, etc. to MP3 files for BlackBerry mobile phone. 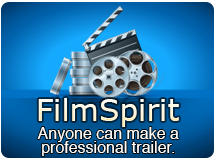 When you find interesting background music or dialogue in a movie or music video, you can extract it from the video of AVI, MPEG, WMV, DivX, MP4, H.264/AVC, AVCHD, MKV, RM, MOV, XviD, 3GP or other format and convert to MP3 ringtone for your BlackBerry phone. To help you change the ringtone on BlackBerry, this BlackBerry ringtone converter can transfer MP3 ringtone to BlackBerry mobile phone memory card directly after making ringtone according to your choice. Set the start and end time of the segment you want to reserve with unwanted parts deleted, and convert it to BlackBerry MP3 ringtone, which makes the ringtone shorter and saves your memory for storing more ringtones. Pre-listening to the music or clipped music segment before converting to BlackBerry ringtone MP3 can help you check whether it's the right one to convert. Load a video or music file and click to convert it, then the BlackBerry ringtone maker will do the left things for you. Making BlackBerry ringtone has never been easier than this! 4Media BlackBerry Ringtone Maker interface is available in English, German, Japanese and Chinese. How make a MP3 ringtone from other video and audio formats for your BlackBerry?